Life Data® Hoof Clay protects hooves from water, mud, feces, and other environmental debris. Life Data® Hoof Clay is a natural, easy to handle, and sticky clay that does not burn or destroy sensitive tissue. The ingredients iodine and tea tree oil give the product unique properties. It provides protection within wall cracks, wall defects, old nail holes, hoof wall separations, under shoes, and the sulcus of the frog for extended periods of time. Life Data® Hoof Clay is a natural, easy to handle, and sticky clay that can safely be applied with your bare hands. It uses a unique blend of ingredients that doesn’t burn or destroy soft tissue. It stays within wall cracks, wall defects, old nail holes, and hoof wall separations for extended periods of time. 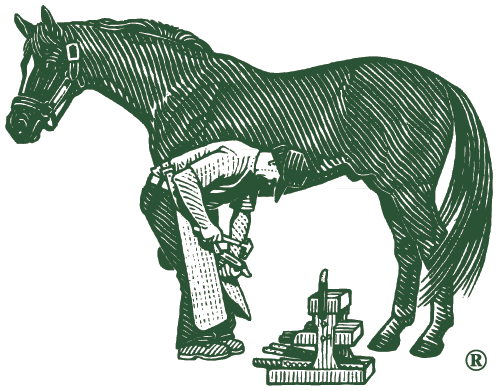 Farrier's Formula® Double Concentrate provides nutrients such as phospholipids, omega fatty acids, minerals, vitamins, and important amino acid "protein building blocks". These nutrients help horses build strong connective tissue proteins that promote healthy hoof structure and growth. Farrier’s Finish® is a liquid hoof dressing that protects against excessively wet or dry conditions. Its non-caustic formulation helps maintain healthy hooves while supporting hoof wall elasticity. Farrier’s Finish® is ideal for horses standing in muddy paddocks, rain-sodden fields, or overly dry environments.